A few days ago the Department for Education released the results of the Key Stage 2 tests taken earlier this year by 11-year-olds at state primary schools across England. 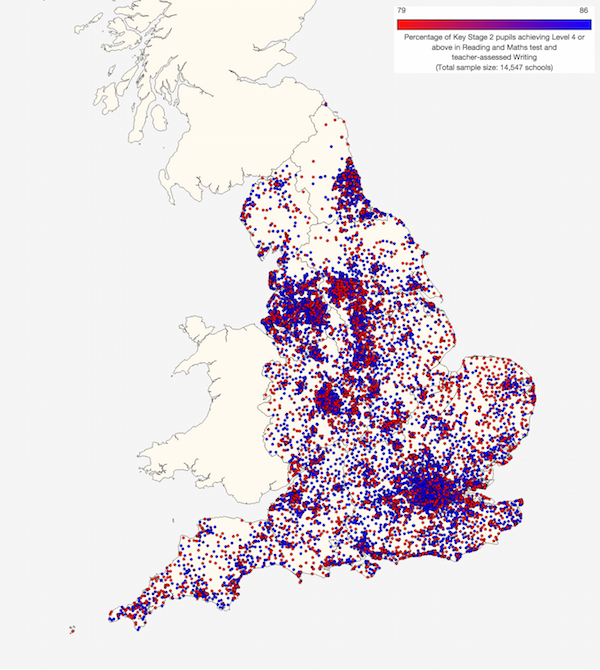 The same data are now available on our Maps, so it's perhaps interesting to take a look at what they show. Overall, London does exceptionally well (again), but the North East comes second, followed by the South East and the North West. So in contrast to GCSE results, there's no clear north-south gradient in primary attainment. On the contrary, the North East has the highest level of academic underperformance at age 7, and London and the North East contain the highest proportions of pupils from deprived families. You can also see this impressive performance in the subject-specific progress that pupils make in reading, writing and maths. This difference in Value Add comes largely as a result of these regions doing an exceptional job in raising the attainment of pupils who previously struggled during Key Stage 1 (up to 7 years old). As a result, they are also the most successful at reducing the difference between pupils who previously showed low attainment and those who who showed high attainment at age 7. Where London and the South East do tend to perform well is among that small subsets of pupils who greatly exceed national expectations by reaching Level 6 (the national target is Level 4). This is evident in reading, GPS (grammar, punctuation and spelling), maths and science. In general, the lowest-performing region at age 11 is Yorkshire and The Humber. This is in part because children there are, on average, already behind in some subjects, such as reading, at age 7. 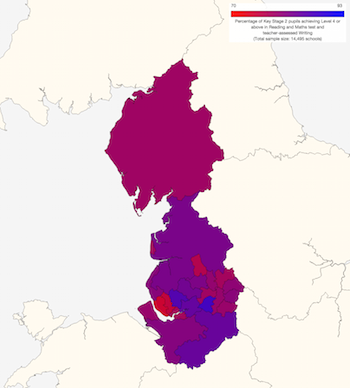 However, children in the North East and North West are almost as far behind at that stage and yet manage to catch up (and then some) by age 11. At the authority level, Bedford, Poole, Medway and Doncaster all stand out as underperformers. 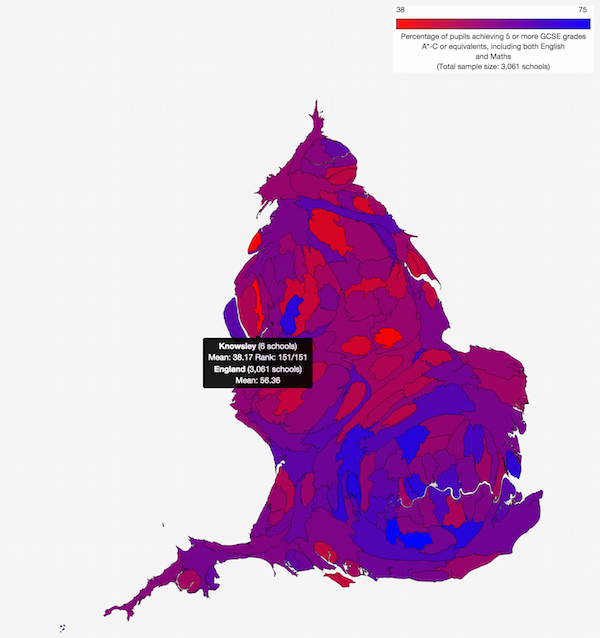 But we should close with a word of congratulation to Rutland, which was almost bottom of the country in 2014 (below left) – only Poole did worse – but in 2015 (below right) pulled itself up to above the national average. Whatever happened there, it might be worth studying. Today saw the publication of Ofsted's annual review on education standards. 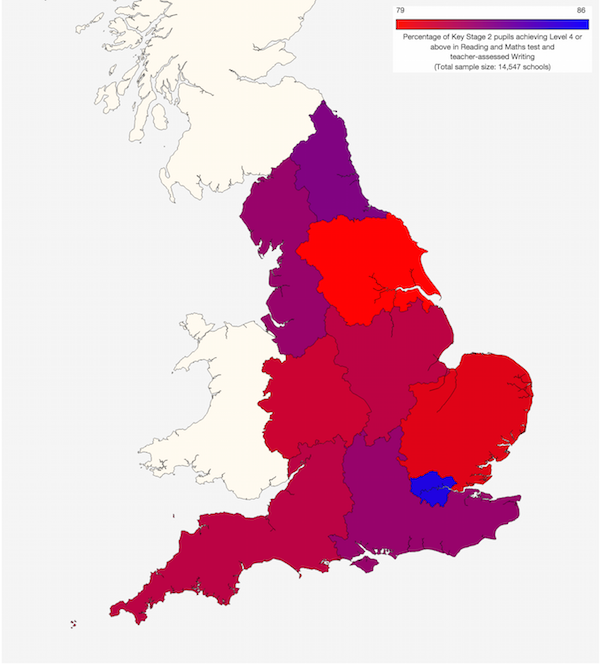 As the BBC and the Guardian (and others) have reported, this expresses concern about the north-south divide among schools in England, something that I've written about before on this very blog. Consistent with SchoolDash's previous analysis, Ofsted concludes that this disparity is particularly acute in secondary schools, and that while levels of poverty and other sociodemographic factors surely play an important part, they do not fully explain it, nor can they be used as an excuse for tolerating the status quo. For example, Knowsley in Merseyside and Blackpool come out poorly in both analyses. True, there are underperforming areas in the south too, most notably the Isle of Wight, but on the whole these tend to be less numerous and less bad than in the north. 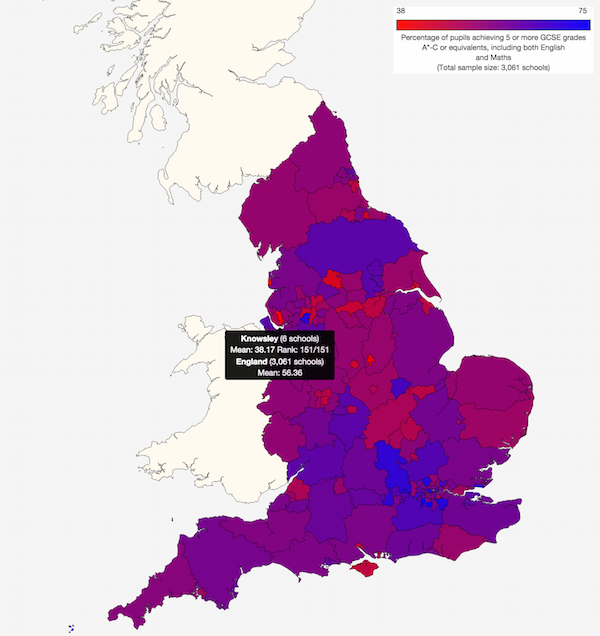 This helps to explain why Ofsted is focusing its attention on the relative underperformance of secondary schools – on the whole, primary schools in the north of England seem to do rather well. What's to be done? That's a tough question, especially for someone like me who is neither a policymaker nor an educationalist. Last week I attended a conference on the north-south divide hosted by Jesus College, Cambridge. What struck me as I listened to the other participants was the deep historical legacy behind this trend, and also the breadth of its impact across all areas of our society and economy. But I was also reassured by the huge amount of intellectual and political will – not to mention general goodwill – that was evident. If there was a divide in that conference room then it was not between those who thought there was a problem and those who didn't. Rather, it was between the pessimists, who felt that the differences are too entrenched to overcome, and the optimists, who pointed to the many existing strengths and successes of the north of England. 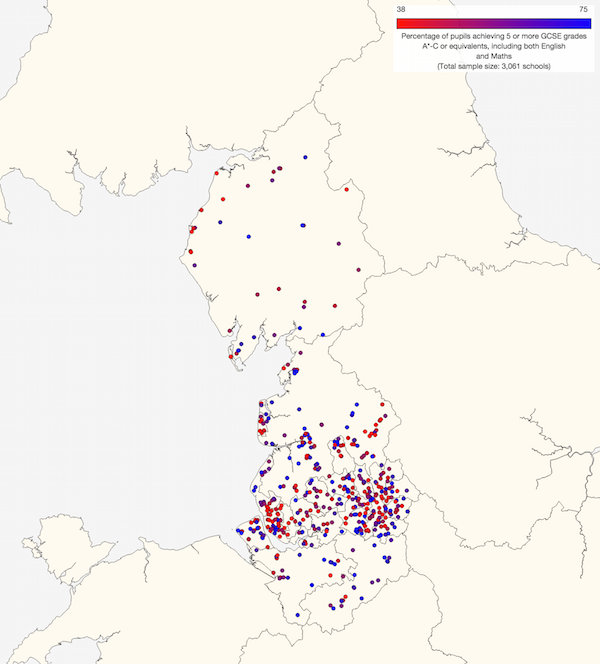 As elsewhere in the country, we see high-performing schools (blue) nestled alongside struggling ones (red). No doubt there is something of a Matthew effect ("unto every one that hath shall be given"), with already successful schools able to attract the most able pupils, attentive parents and effective community engagement. Any school coming from behind is not only racing to catch up but also combating their own particular headwinds. Yet with the right kind of support it can surely be done. One suggestion, also reported today, is the idea of pairing struggling schools with more successful ones, an approach apparently used to good effect in the London Challenge initiative. Especially given the geographical proximity of many such differently performing schools, that sounds to me like something worth trying. In a couple of weeks' time I, an almost lifelong southerner, will be venturing north to visit a school that has been underperforming but now has an extremely talented and committed headteacher who's working hard to turn it around. For me that will no doubt provide a glimpse into the harsh realities behind the rather abstract numbers with which I spend so much time – a dot on the map made real. I look forward to it greatly.